Back in the mid-noughties, when Disney and Pixar weren't really getting along and things looked iffy for the continuation of their working relationship, a company called Circle 7 emerged. They worked on things like 'Toy Story 3' and 'Monsters Inc. 2' and although their work was later entirely scrapped, a trailer (of sorts) has turned up for the latter. Pixar and Disney would renew their partnership in 2006, and Pixar head honcho John Lasseter didn't want the outside work of Circle 7 compromising their internal visions so started afresh. A few bits and bob have cropped up on the internet recently, including 'Toy Story 3' concept art as well as the 'Monsters Inc. 2' images, which screenwriters Bob Hilgenberg and Rob Muir put up the other day. Their vision of a sequel to the original 'Monsters Inc.' was to have Sully and Mike visit Boo to wish her happy birthday, only to discover that she'd moved, and then decide to track her down in the human world. "Insiders" say that Bob and Rob's 'Monsters Inc. 2: Lost In Scaradise' was at least as good as the original, if not better. Shame we'll never know. 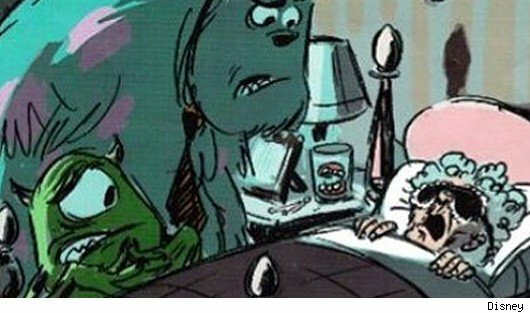 A second Pixar 'Monsters Inc.' feature is scheduled to appear in 2012.